After our long Pacific crossing we were looking forward to starting our travels through French Polynesia. 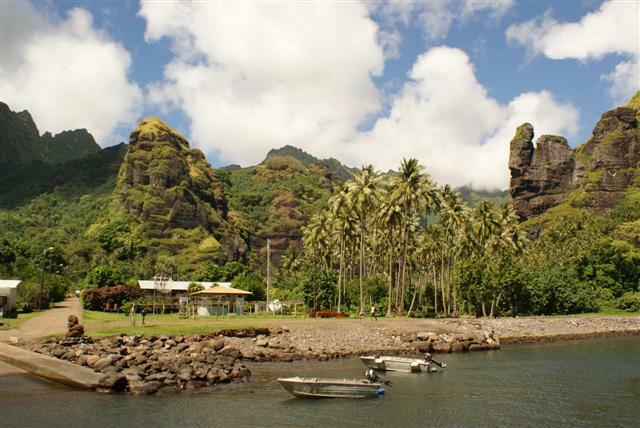 So the everlasting journey was over and we made landfall at the Bay of Virgins on the island of Fatu Hiva, which has the most beautiful anchorage with superb rock formations at the entrance. 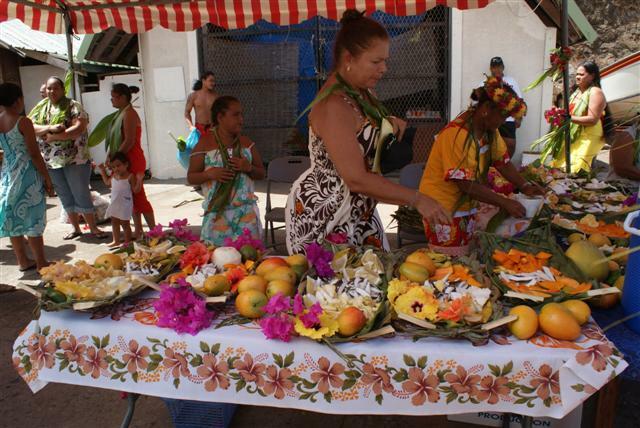 Fatu Hiva is an authentic island where life is very simple. 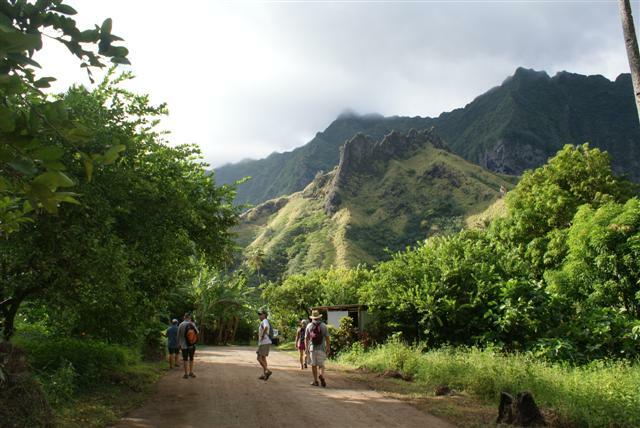 It’s the most southern, wettest, lushest and the most untouched of the Marquesas. It’s made of two volcanoes joined together with extreme geology. 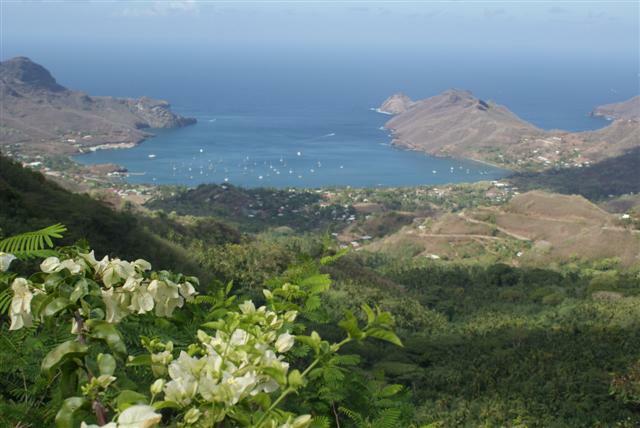 There are only two villages on the island and the Bay of Virgins surrounds Hanavave on the western side. We spent the first afternoon on Bali Blue which started off as ‘come over and have a beer’ but quickly became the welcome boat with more BWR yachts arriving with champagne to share. It was wonderful to celebrate the achievement of crossing the great Pacific ocean. The next day we went ashore with Peter and Carol from Bali Blue and David and Susan from Enchantress to find the famous waterfall. We walked through the village with lots of smiling happy faces looking at us, shadowed by the impressive over hanging rock formations. The walk was only about 3 or 4 miles but it was through jungle terrain and the last half-mile would have been more suitable for a mountain goat, but eventually we found it and couldn’t wait to strip off our sweaty clothes (costumes underneath) and jump in the cool mountain water. We sat around on the rocks for a while to dry off and then started the trek back down the hill. We were invited to join a local family for a meal that evening along with the crews of Chsalonina, Norsa and a lovely swiss couple in the anchorage. The locals don’t deal in money but are pleased to accept ropes, fishing tackle, toiletries and alcohol, which we were happy to supply. I took some little necklaces and hair slides for the little girls in the family. They made us feel really welcome and we enjoyed fish in coconut milk, chicken, and an assortment of vegetables, some of which we had never seen. Technically we were there illegally because there isn’t a check-in post in Fatu Hiva so the next day we left to go north to join the rest of the BWR fleet that had gone straight to Nuka Hiva. 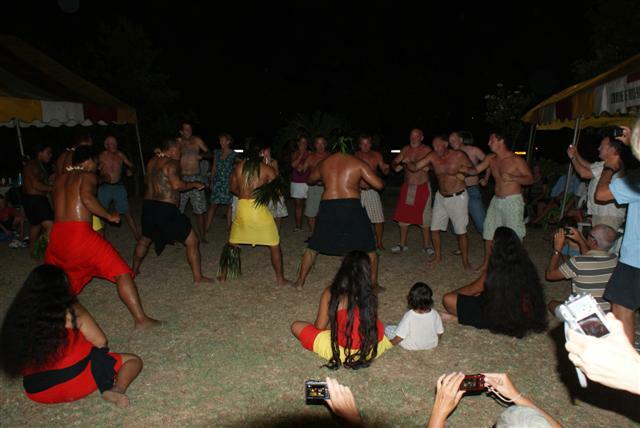 We stopped at the island of Tahuata over night on the way and got to Taiohae bay, Nuka Hiva the following evening so we were able to take part in the official welcome that was starting the next day. Fionn from BWR was there to welcome us as well as the local mayor, we were supposed to be presented with the Polynesian leis but apparently the rain had spoiled all the flowers. The mayor officially welcomed us while the locals performed a welcome dance and had laid out a fruit platter for us to enjoy. 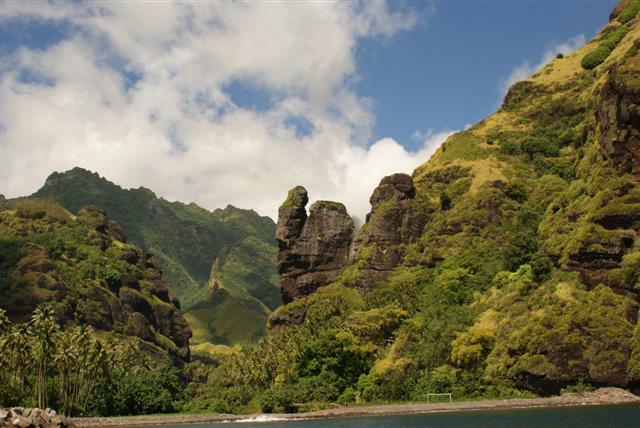 Nuka Hiva is the largest of the Marquesas at 345 square kms and the most populous with over 2000 inhabitants. The Marquesans are among the most creative in the Pacific. 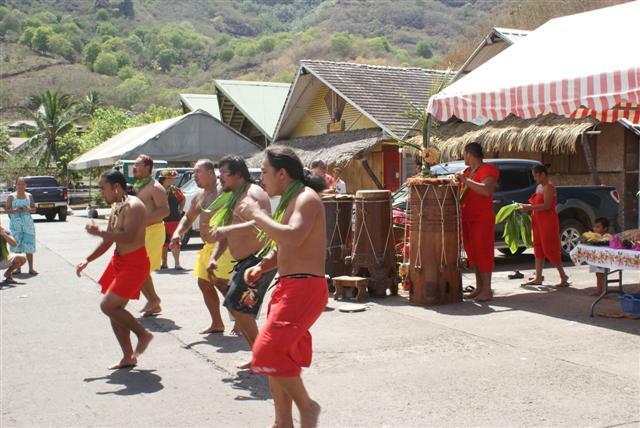 The traditional arts of tattooing, carving and tapa cloth are all evident in Taiohae. The bay is a flooded volcanic crater with jagged walls that plunge into the ocean below. It doesn’t have a fringing reef or many beaches. The few beaches they have got are black sand and they are full of no-no flies, which leave a nasty bite so we’ll stay away from them. We walked up to the big hotel for Sunday lunch, which was a nice treat after 3 weeks at sea. It had a veranda overlooking the bay giving stunning views of the yachts at anchor in the bay. In the evening we were invited to a ‘lovo’ supper at Rose Corser’s restaurant just below the hotel. This consists of a whole pig cooked in the ground, covered in banana leaves and hot stones. It had a strange taste but we all enjoyed it. Afterwards there was more dancing from the locals by both the men and the women and then our men were invited to join in. Bill decided to have a go. I managed to get some photos in between rolling on the ground laughing; they looked more like apes than Polynesian dancers! Monday morning Bill went to customs to check-in while I went to find a supermarket. We still had a lot of our Panama goods but it was nice to pick up some fresh fruit and veg although we found French Polynesia very expensive. In the afternoon we sailed to Daniels bay a couple of miles along the coast. There wasn’t much room but we all managed to squeeze in. We went ashore in the evening for a bbq and a sing-song but we all looked like german dancers as we kept lifting our feet to slap the flies off our legs. 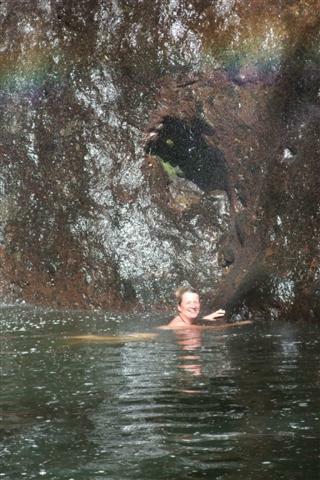 In the morning a lot of the crews went ashore to walk to a waterfall but after seeing the stunning one in Fatu Hiva we decided not to join them and Bill set about his jobs list instead. 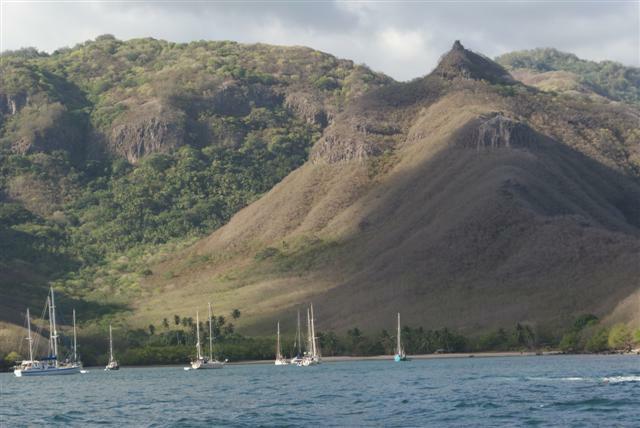 We sailed back to Taiohae bay in the afternoon. 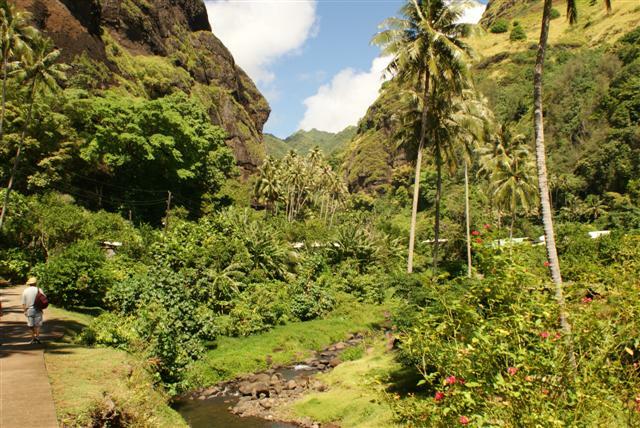 The best way to see Nuka Hiva is by 4×4 vehicle so on the Wednesday the crews of Enchantress, Fai Tira and Aspen (USA) joined us as we got into 2 vehicles and set off with our guide Richard to see the sights. We started off by driving up the Muake at 864 meters high for a sweeping view across the bay. We continued on to Houmi past the vanilla plants that grow wild across the valley to stop to look at a magical church on the banks of Controller bay. We zig-zaged back up the winding road to Taipivai, whose ancient warriors were cannibals, for a magnificent view out to sea with the island of Ua Pou in the distance. We continued across the mountainous terrain to Hatiheu on the north coast with its black sand beach for a delicious lunch at Chez Yvonnes. 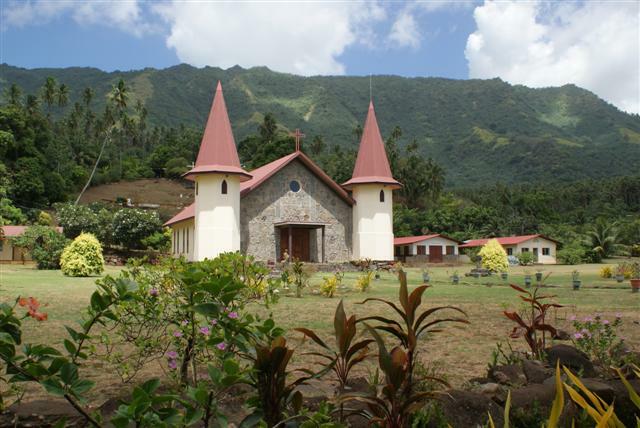 The Hatiheu church stands majestically overlooking the village. We drove up into the jungle to the restored archaeological site of Hikoku’a Tohua home to many ‘paepae’ or stone platforms and a huge ‘tohu’a’, an ancient gathering place decorated with many petroglyphs. 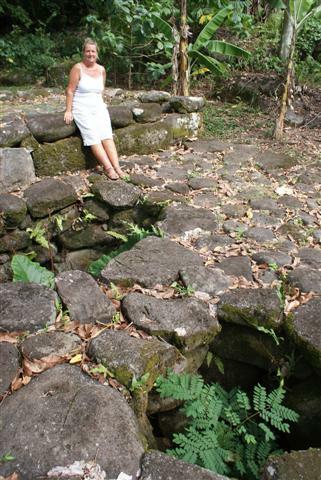 The me’ae or ancient cult worship site consisted of several terraces of large blocks of stone next to a sacred Banyan tree, where in ancient times the Marquesians would have held dances and banquets. Many human sacrifices were made to the goddess Te Vana’uau’a. The victims were kept in a ‘bone’ hole until it was their turn to be consumed at the cannibal feast. 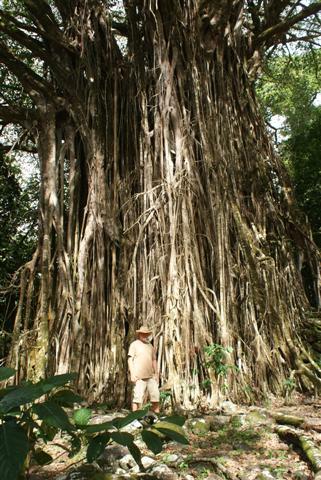 The Banyan tree in the photo is a famous one that’s featured in many books because when it was discovered by the first missionaries it was full of skulls. We continued through the jungle to find many more me’ae sites some with ancient hiamoe or sleeping platforms watched over by sculptured stone tikis or phallic fertility statues that keep the secrets of the ancient rites once practised there. 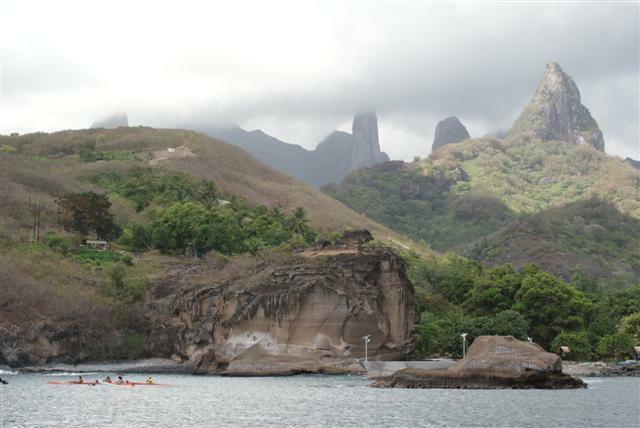 The site is among the largest and most intriguing in the Marquesas and as with all archaeology I found them fascinating. Richard was very informative but intrigued at my interest in everything. We drove back across the island to the boats. We spent the next few days sorting out the boats ready for the next leg of the journey and doing boring stuff like laundry, wifi, etc. 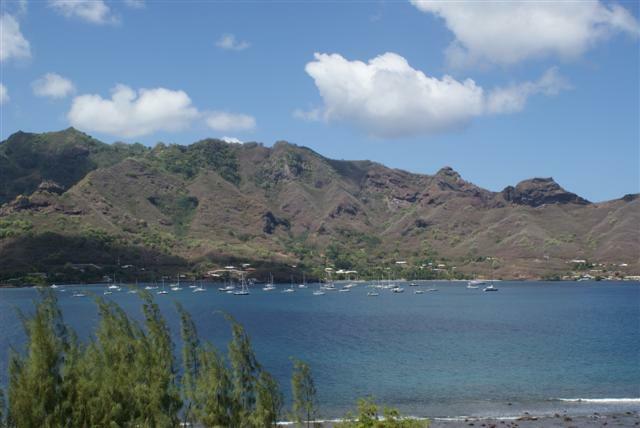 We left early Saturday morning for Ua Pou, the third largest island in the Marquesas, which lies about 25 miles south of Nuka Hiva. The weather wasn’t very good and the anchorage looked very rolly so we decided to continue on our journey to the Tuamotus. Sadly we turned south away from the beautiful Marquesan islands, our visit had been far too short. Posted on April 24, 2010, in Port posts. Bookmark the permalink. Leave a comment.